No longer a hushed retreat dedicated exclusively to the book, the modern library embraces study, interaction and the use of digital and social media. 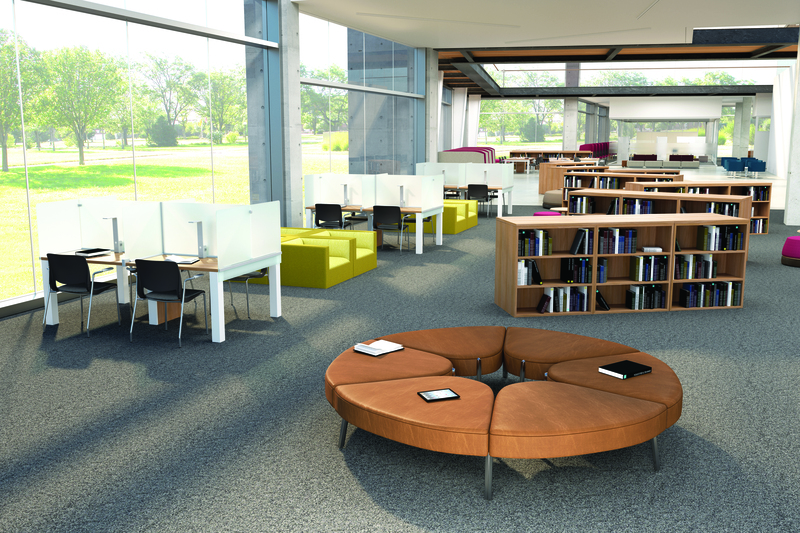 While Primary use of the library continues to be solitary effort, multiple types of spaces and furniture are required to meet emerging demands: tables fitted with privacy screens in quiet work areas, welcoming lounge chairs in reading rooms and larger tables to share with study partners in project rooms. 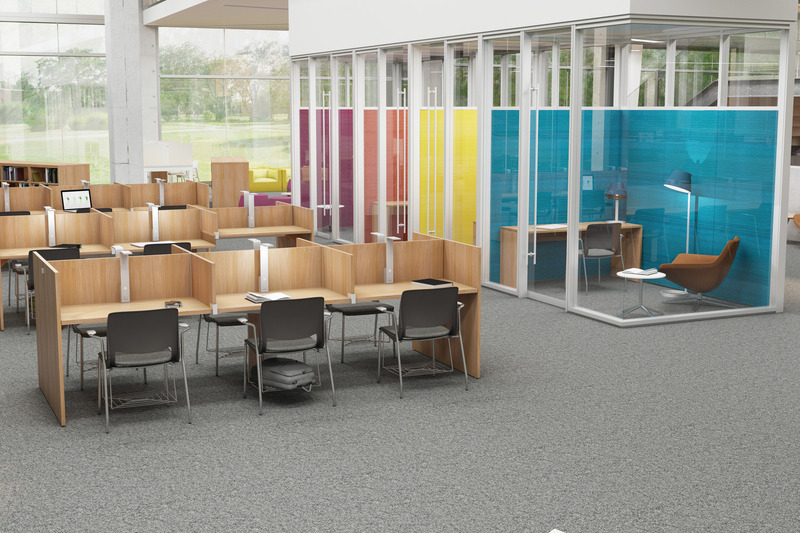 Teknion products allow universities to leverage available space and resources to create libraries that remain vital as centers of learning, culture, history and innovation. Glass architectural walls redefine the traditional project room,creating a sense of openness that invites usage. Equally, appealing furniture forms—including ottomans, lounge chairs and benches—replace standard tables and chairs, yielding an informal and even playful space conducive to creative thinking. 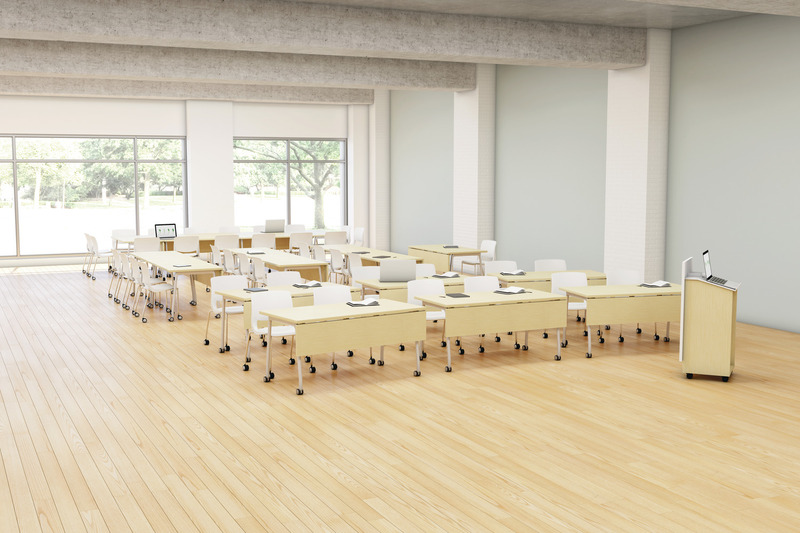 Technology-enhanced project rooms may support interaction and collaboration via a video screen that brings off-site students, teachers and thought leadersinto the room. The conventional project room also has its place on today’s campus. A choice of table heights allows students to sit or stand and comfortable seating provides ergonomic support during long work sessions. Influenced by working adults who seek mobility, flexibility and comfort, Zones comprises seating, tables, screens, easels and accessories suited to a variety of preferences and learning styles. 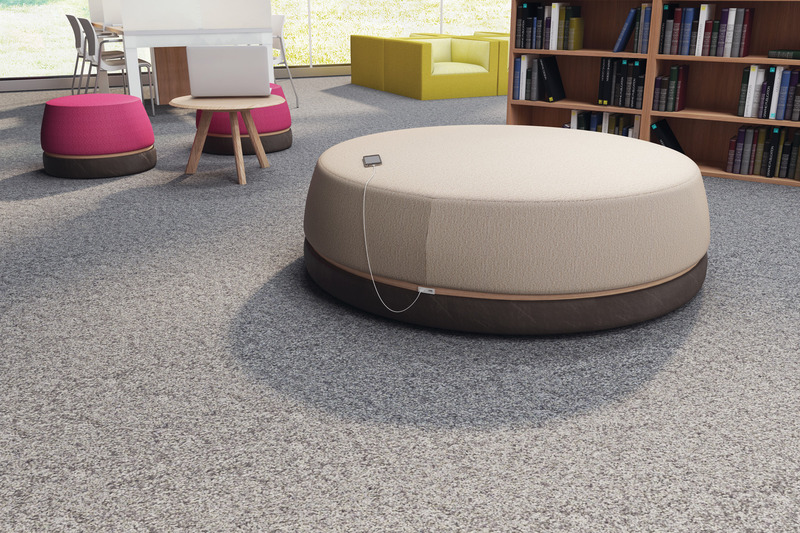 A series of Zones modular seating elements can anchor a large, open space, while Cesto Poufs complete a relaxed setting for group meetings. Tek Pier integrates a height-adjustable worksurface and wall-mounted monitor to create a focus for group work. Integrated power/data access facilitates the use of technology for collaboration. A Thesis High Team Table paired with Variable seating encourages students to adopt different postures, making it easy to stand, lean or circulate around the table. Altos and Optos architectural walls delineate an innovative project room, providing acoustic privacy while maintaining transparency. 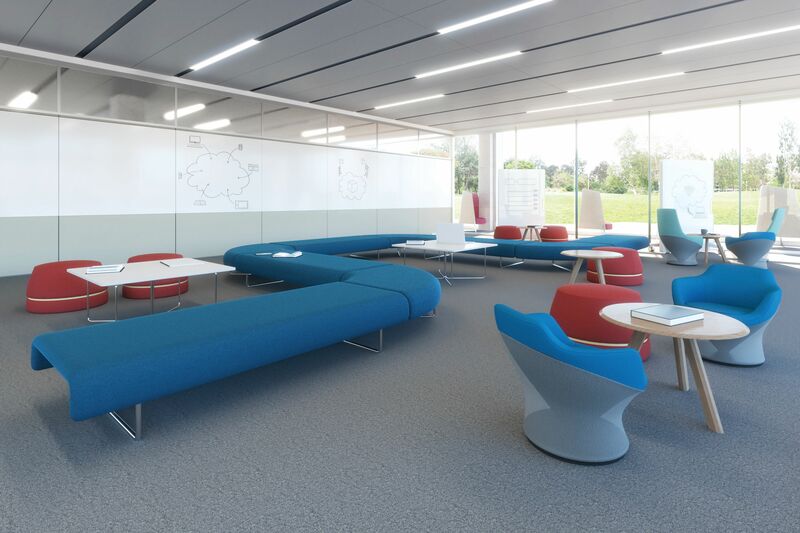 In an open space, Zones Modular Seating creates structure and organizes the space, while reconfigurable Ottomans, Dual Lounge seating and Thesis Markerboards set the stage for dynamic discussions. 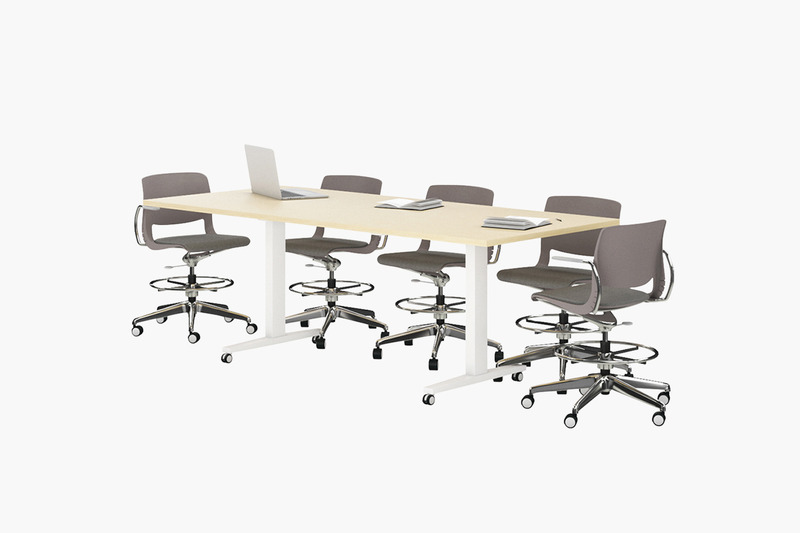 Encouraging students to change postures, Navigate heightadjustable tables allow a project team or study group to work while standing or seated. Some part of the modern library must still be dedicated to spaces for heads-down study, where students can work without distraction or interruption. Generous study carrels with opaque panels delineate individual spaces for reading and research, rather than conversation. Phone booth style cabins speak to privacy even more clearly, while glass architectural walls admit light and avoid an uncomfortable sense of enclosure. In the alternative, high-back lounge seating allows students to choose a protected personal “bubble” that is more open and available than a cabin. 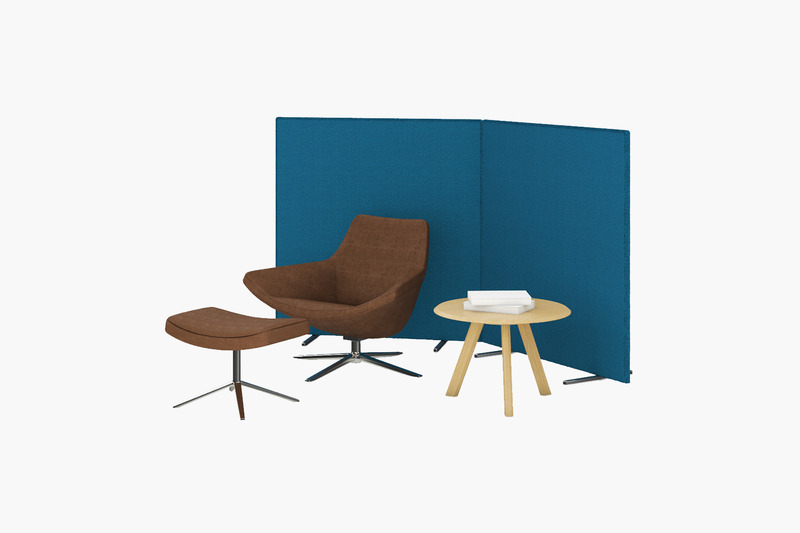 Strategically placed screens can also be used to create semi-private areas where focused work takes place. 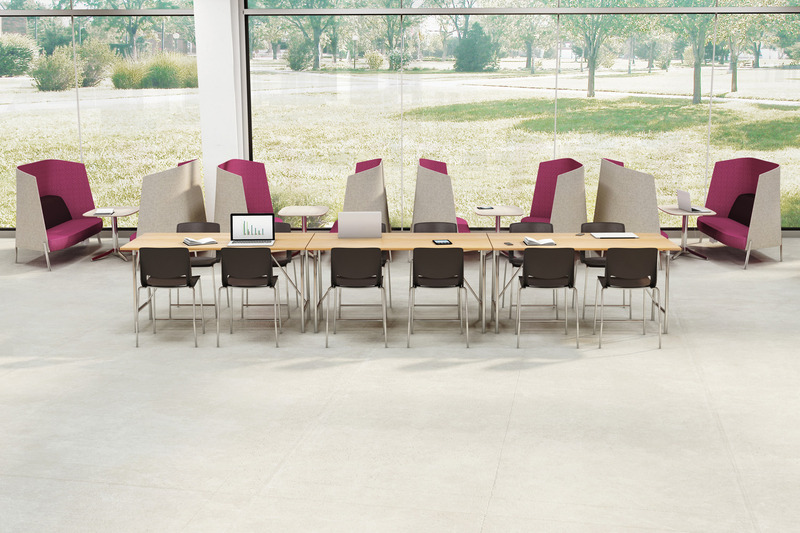 Thesis library tables with Carrel Dividers are ideal for focused, heads-down study. Study rooms enclosed by Altos and Optos architectural walls create a quiet space with more privacy, while the sliding Barn Door addresses space constraints. An Expansion Casegoods desk and Metropolitan ’14 chair, paired with a Sanna lamp, allow students to work in multiple positions. In an open study area, a rectangular Thesis Library Table with no division creates a study space for more extroverted students. The Thesis Power Cube provides access to power. The Fractals upholstered High Back Chair invites individual students to retreat in a semi-private space adjacent to an expanse of large windows. In a space dedicated to quiet individual work, the Metropolitan ’14 chair offers an invitation to comfort while reading or reviewing lecture notes. The Lite Wall creates a sense of privacy. To optimize resources, schools require flexible spaces that support shared learning and individual needs. By placing study carrels and lounge furniture in proximity, the space facilitates both quiet study and light interaction among students. 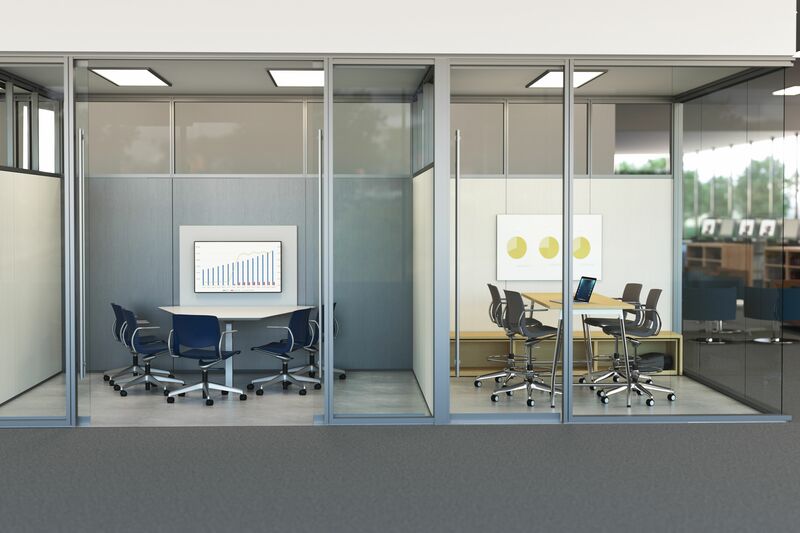 Study carrels fitted with glass partitions create a nook that offers visual privacy without discouraging contact. Low-back lounge seating invites serendipitous interaction and low-height bookcases make it easy for students or faculty to visually explore the space from any point in the room. 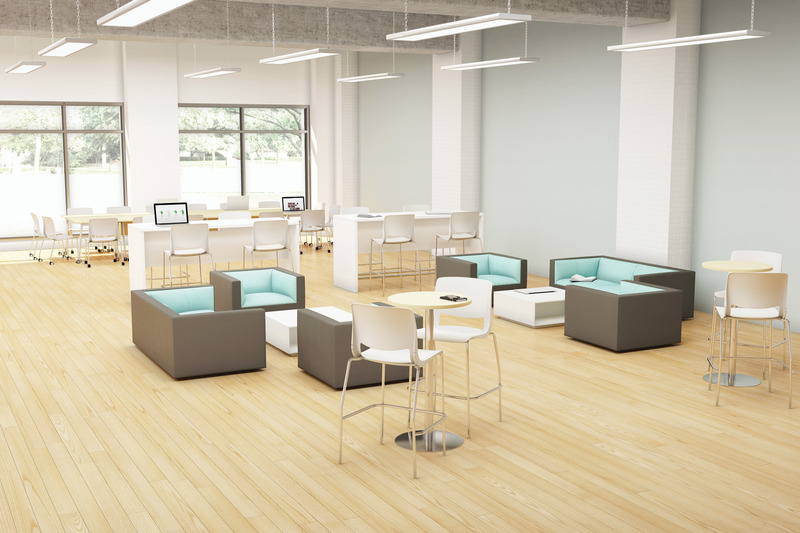 Casual lounge furniture equipped with power outlets quickly attracts students who gather to study, relax and recharge phones and laptops. 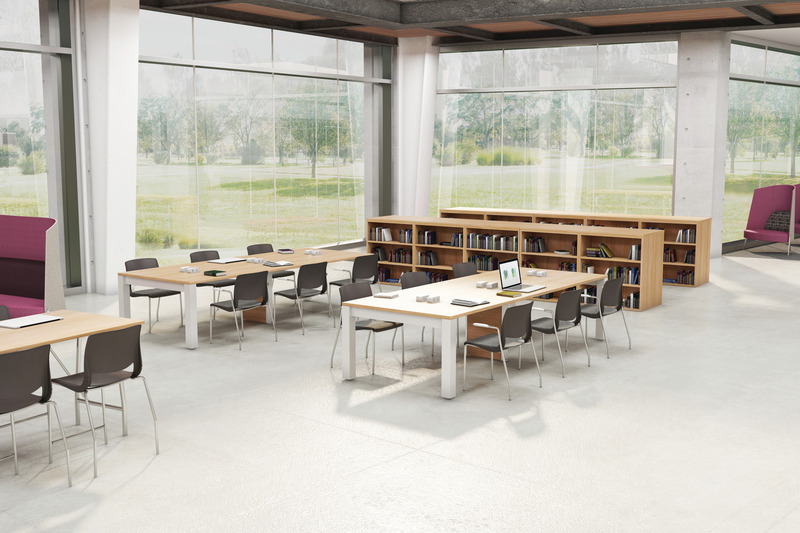 Thesis Library Tables divided by translucent glass screens minimize distraction while admitting daylight. Crisp lines of the tabletop and table legs maintain a clean, contemporary aesthetic. 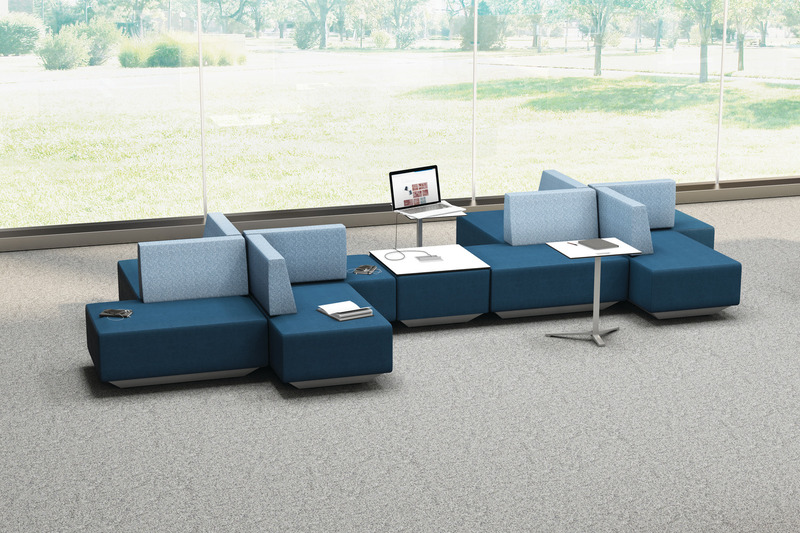 Teknion dna is a line of modular seating comprised of components that combine to compose different shapes. Power is routed through all unit bases. Complementary tables support laptops, notebooks and coffee cups. Qui Ottomans create a setting for individual reading and light interaction. Integrated power and USB outlets allow students to recharge personal portable devices. 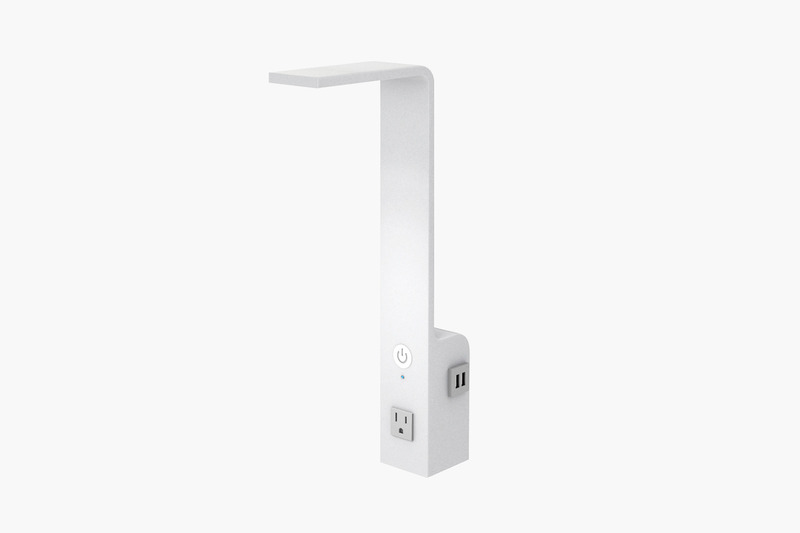 Designed specifically for learning and study tables, the Thesis Reading Lamp features an LED power indicator and automatic turn-off after three hours. Power and USB outlets allow quick recharge of personal devices. In-between spaces exist within or adjacent to the library, in corridors, lobbies and courtyards. Ideally, the in-between space lends itself to a variety of activities. Standing-height tables invite passersby to stop and perch on a stool for a chat or to check emails. Both standing and café height tables can be combined to create a social landscape where students gather for coffee or to share class notes. A series of tables that extend to accommodate several students is also an option. 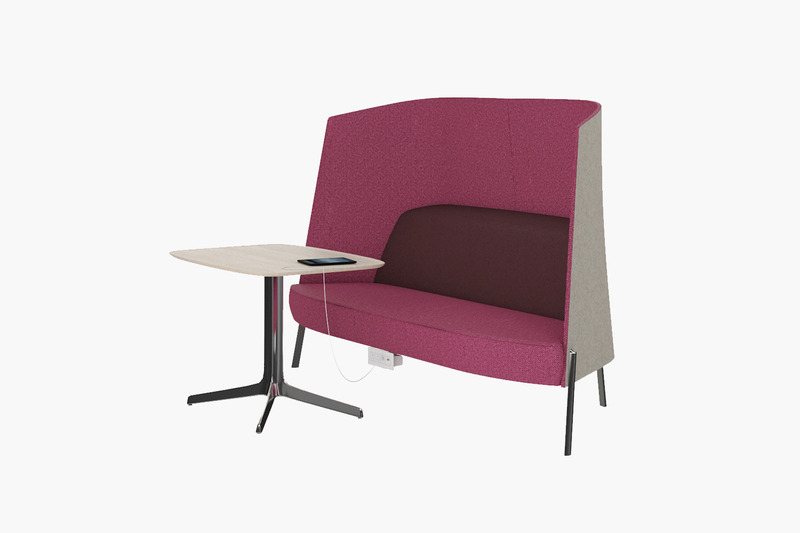 If a student wishes to escape from the active milieu, high-back lounge seating offers a degree of privacy for personal phone calls or intimate conversation. Equipped with convenient power access, the Expansion Cityline fence provides a structure suited to multiple informal meeting formats. The fence blends with Qui Ottomans, Beso Stools, Bevy tables and Pala Lounge chairs to allow for different postures. Pairs of front-to-front Fractals High-Back Settees create the intimate feel of a restaurant booth, while the upholstered back helps control ambient noise. Thesis High Learning Tables offer an option for accommodating group discussion. 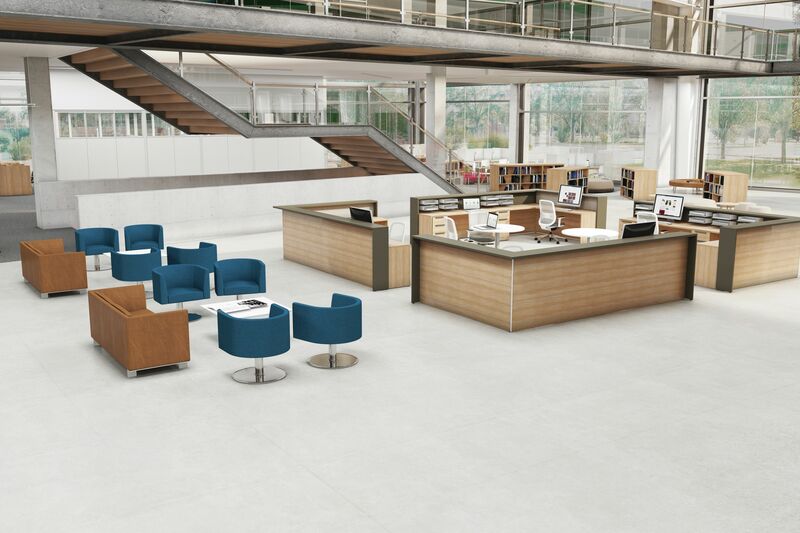 The Expansion Casegoods line includes reception modules that can be arranged to form a variety of shapes. Reception desks feature optional tackboards and accessory rails. 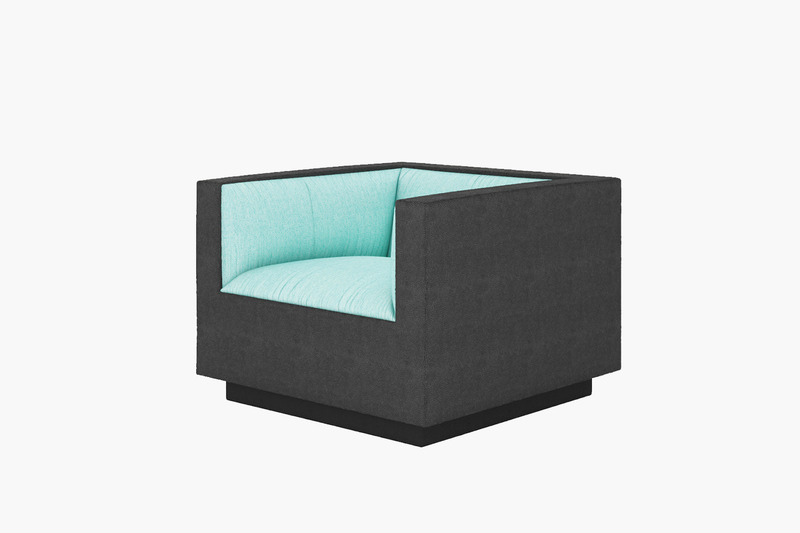 Classic Vignette seating expresses a contemporary point of view. Within the library, space must often serve a variety of programmatic needs: seminars and colloquiums, readings, social events and student, staff or faculty meetings. 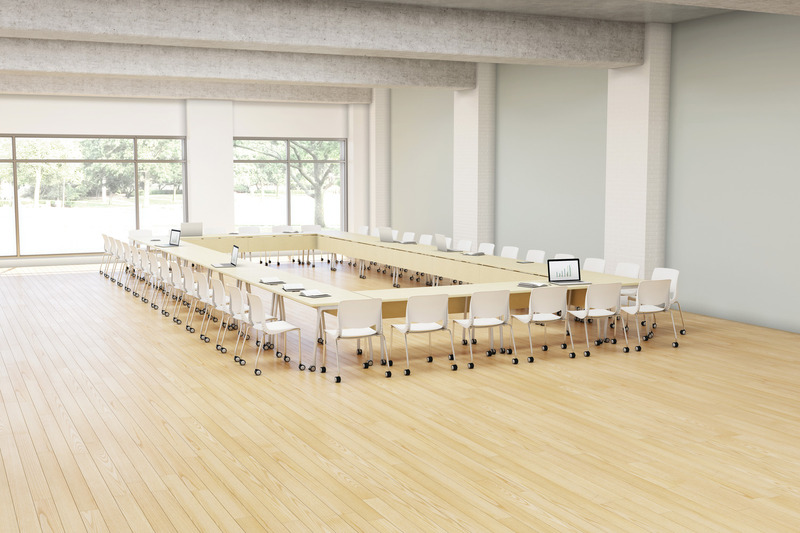 Furnished with lightweight, mobile tables and chairs, a room frequently used for faculty meetings can be quickly reconfigured for an academic conference or a reception for a distinguished visitor. These spaces can also be used by student organizations as a place to plan campus events and activities. Flip-top tables, nesting tables and stacking chairs are easy to move around or to store, while lounge furniture and café height tables contribute to comfort and ease. A mix of fixed and mobile furniture allows students to choose how they want to work. Seating and tables of different heights provide additional choices. Infinito lounge seating, Thesis Hub Tables, Thesis Learning Tables and Cafe Tables are all appropriate for dynamic multi-functional spaces. The mobility of Thesis Flip-Top Tables and the Thesis Lectern allows the space to be arranged and quickly re-arranged to create different settings. Linking Thesis Flip-Top Tables together creates a large group setting suitable for seminars, colloquia and speaker presentations. Endowed with a strong architectural presence, Infinito lounge seating gives definition to reception, lobby and lounge areas.